Since today is MOTHER 3’s anniversary and all, I thought now would be a good time to look at Weekly Famitsu’s review of MOTHER 3 from three years ago. It got a 35 out of 40 points possible, which is a pretty sweet score. It was the highest rated game that issue, with the second closest game getting a 28. 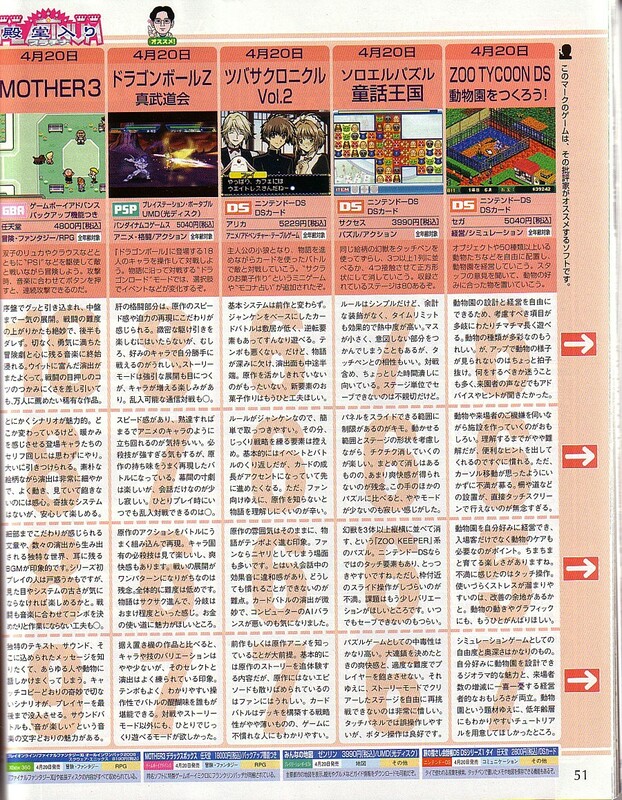 If you’re curious, MOTHER 2 got a 34 when it came out, I’ll post that scan and review another day, though. Also, if anyone has the Famitsu review for MOTHER 1+2, please let me know! POLL: What would you rate MOTHER 3, using Famitsu's 0 to 10 scale, with 10 being the highest? Very interesting. I need to take a closer look at all these reviews. Lol nobody said anything lower than a 9. I gave a 10, naturally. If you don’t let the look of the game’s engine or its age get to you, you can probably enjoy it. Yeesh, get over it, Watanabe. This kind of comment is purest doughhead-kiddie technofetishist gamergeek – but otherwise the article is awesome. Hanamura’s description of the game as a “rare piece of art” is dead on. I went with a nine if only because of a few quirks with the game’s battle system (mainly that rolling HP should have included the 0 HP saves like in MOTHER 2 as they could have been a lot more frequent, and rewarding, in MOTHER 3). To me it excelled in every single thing I look for in a game, and much more. It currently stands at my favorite game, and I’m not even that much of a fanboy. 10 from me. Mother 3 is one of the few games I’d give a 10, even if using a more precise decimal scale. For the record, I’d probably put EarthBound at a 9.6.
sorry, you’re not making any sense. Who the hell voted 0 up there?! I voted it a 9, because nothing is perfect. Ooh, someone rated the game as a 1. What a rebel. Wibatt: That’s a pretty fair statement. Mother 3 is a great game, but at its core, the battle system is still pretty basic jRPG stuff, and that’s definitely going to turn some people off. He doesn’t even hold it against the game, so that kind of reaction is unnecessary. I voted a 9, because its almost perfect. Only problems I encountered was that near the end of the game there was some slowdown/low framerate. Not unplayable, but definitely not pleasant.Also, the PSI in the game worked a little differently than Mother 2, making the game easier. Not really bad, but I’m not so sure that was a good idea. that’s not an acceptable excuse (at least in my opinion) did you play with an emulator or flashcart? neither are perfect, the only way to get the ultimate experience is the play the real game on the real gba/nds. He doesn’t even hold it against the game, so that kind of reaction is unnecessary. OK, I was being harsh. Pardon. I wish it was in 3d.. I can’t decide if I want to give it a 9 or a 10.. The two people who rated it 0 obviously can’t read. THE BEST SCORE IS AT THE BOTTOM. PAY ATTENTION NEXT TIME. You guys are taking the poll too seriously 😛 In any poll with any decent # of votes, there will always be the statistical few who like to mess around just to be funny/cool. They’re just a mathematical phenomenon so don’t give it any worry. I am not a huge video gamer. Most of the time I can’t even get myself to finish a game all the way threw even once. But this game!! This game i’m on the third Play threw, and I know I’m gonna start it over Again once I finish! Wait, why do they add up the scores instead of averaging them? That makes no sense! 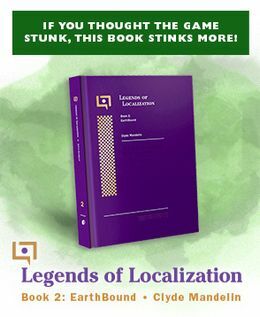 I think the reviews are fair, if not a little strange (I guess there’s meaning to that fourth review that loses it’s effect in translation, I dunno). The Mother series will never appeal to everyone because it’s simply not some people’s cup of tea, but in my eyes it offers so much that hasn’t done in other games and pulls it all off so well. I personally see no reason to give the game anything lower than a 10, but hey, opinions are opinions. I gave it a 9, but that’s because I felt it could have been longer. It almost felt like some parts had been cut out. I still like EarthBound better, but that’s just my preference. What I would really like to see is a continuation of the series after the 3rd installment. I would give that one a 10 just for existing. It deserves a 10 because it is very fantastic. Gave it an 8, and I would give EarthBound a 10. First of all, I thought EB had a simple yet perfectly effective battle system for my tastes, which didn’t really need any improvement. (That’s just what I like, I know I’m probably in the minority here!) I think the more elaborate story involving the main characters in this game as compared to EB took the game a little more in a different and, may I say, more generic direction. The lack of that was something I really appreciated in EB. Lastly, there were simply too many EB references for me–they made me smile, but after a while, I was just like, “Hey, I’m playing M3 here, not M2. More originality, please.” The way the story went in a different direction in this game made it apparent Itoi wanted it to be seen as its own game, but I feel like the excessive references took away from that. @Pipomonkeydude – Is dividing by four really that important? Dividing by four gives you a number out of 10. 0-40 is a scale no one else uses. Its good to have a # out of 10 for comparison purposes too. Famitsu goes way back to the mid-eighties, so it’s not like this scale is anything new. The story was kind of… meh to me. And besides, we all knew what the final boss would be, and what would happen to him after the final confrontation. Famitsu may be consistent with their scale, but that doesn’t mean it isn’t random and strange. It’s actually a point of real contention among some reviewers how some folks consider 6 or 7 “average” instead of 5 as the average, what poses as a ‘pass’. 6 or 7 is not a terrible score. It’s “good, but with too many flaws or issues to be great.” 5 is right in the middle, yeah? It’s just become such an unattractive number because it’s right on the cusp. What doesn’t make sense? “Zero HP saves”? If so, that’s just when your HP rolls down to zero in EarthBound and you manage to heal or finish the battle before the death message, you manage to live. That’s gone in MOTHER 3 and it can actually be pretty damn frustrating in some battles. Mother 3 doesn’t seem to have the “survive with 1 HP because of your Guts” thing though. What did the first Mother get in Famitsu by the way? yeah, i think the scrolling hp bar in mother 3 is actually a lot better than earthbound’s. Score Archives, MOTHER 1+2, which contains MOTHER 1, has a score of 35/40 as well. Maybe we’re thinking of two different things. I’ve never had to rely on a zero-HP save on the last boss of chapter 1, even on a low-level run. I can remember fighting the Steel Mechorilla on a low-level run countless times and continually getting LifeUp to cast right when a character hits zero HP (right when it would normally work in MOTHER 2), but they die before the effect takes place. I have no way of making the situation consistently happen, but I’ve encountered it dozens of times. I think you must be referring to some other thing using a confusing term. There is absolutely no way you can beat the Mecha Drago without its last hit hitting you for way more HP than your max HP, so you have to get to the You Won screen before it rolls to 0. The final battle in the game relies a lot on this same thing. Maybe you’re referring to some other much more obscure thing having to do with exact timing. Looks like we were talking about two different things. You’re just talking about basic rolling HP, but I was talking about what happens when your HP rolls to zero right when the battle ends. In EarthBound, if you manage to defeat the last enemy in a fight right when your HP rolls down to zero, your HP rolls back to 1. In MOTHER 3, you just die. It might sound trivial, but I’ve had this come up several times on each of my playthroughs, often during significant battles. 9 above of course…but if the covergirl should change to covermother??? I already posted this before, but nobody answered so I’ll ask again. Is there anyone out there that has Super Mario Sunshine? Yeah, I know it’s a dumb question to ask on a MOTHER website but there’s this noise that plays whenever a news report appears on the screen. In MOTHER 3, the same noise plays when Porky is about to speak or when you’re about to exit the elevator, but slower. I just wanted to know if MOTHER 3 took that or if it’s just a coincidence or if it’s from something else. In Japan, it’s common for announcements (especially made by speaker) to be preceded by that sound. Elevators also usually make a specific special sound too. There are all kinds of things like that over there. So they used it for Super Mario Sunshine and MOTHER 3? I give it a 10. Mother 3 is a perfect game for me. Best Story I’ve ever heard in a game, great characters, the 2nd greatest video game Soundtrack (after the one of EarthBound), funny and heartrending. I played many games (like FF3/6, Chrono Trigger, Zelda, Metroid and all) but none of this games is as great as Mother 3.